There is great value in being a member of a national fraternity. There are financial benefits because there are obviously more brothers contributing by paying their national dues. This enables the fraternity to be professional in every way – from the leadership staff to the national events that they put on. Most national fraternities also have the resources to give scholarships to deserving brothers. Most also have foundations that enable fraternity alumni to contribute to these causes tax-free. Also, the national fraternity provides a very valuable service by having an insurance policy that covers the chapter. The last thing you want is to have any liability for the actions of brothers years after you graduate. That being said, your chapter is paying the national fraternity a tremendous amount in annual dues. Ignoring what you pay in insurance – your chapter probably pays a minimum of $150 a man in national dues. This very well could be the single highest line item in the chapter’s operating budget. As a leader in your fraternity, it is imperative that you demand that the national fraternity provides you enough value for what you pay in dues. Obviously, this means that you need to take advantage of regional and national events the fraternity offers. You are paying for them; you need to be sure you are benefiting from them. Be sure that those who attend these events are the ones who can benefit from them. It probably doesn’t make too much sense to send a senior who has one semester before graduation. It also doesn’t make much sense to send a guy who is only interested in going to party. Send someone that is eager to learn and take what he learns back to the chapter. You also need to take advantage of having a leadership staff. 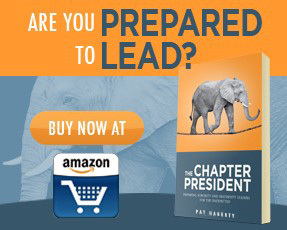 They are there to make your chapter more successful. However, it is up to you to reach out to them and get guidance. There is rarely anything you will face that they haven’t encountered before. Their expertise is there to put you in a position to be successful. So how do you take advantage of their knowledge? By staying in constant communication with them. Send them emails. Call them when you need them. Realize that they are brothers with a vested interest in your success. Allow them to help you. Finally, take advantage of the financial resources the fraternity offers. Be sure that your brothers apply for scholarships. Don’t let them be too lazy to apply. If the fraternity offers funds for special programming, take advantage of that too. If you have a great programming idea, ask for help. Again, they are on your side and have the resources to support great initiatives. I realize that most of you out there think of nationals as the enemy. Please realize that this couldn’t be further from the truth. They are your fraternity brothers who want to see you do well. Yes, they will hold you accountable when you need to be held accountable, but they will support you if they know you need help. So let them. Challenge them, ALWAYS RESPECTFULLY, to provide great value for the thousands of dollars you pay them a year. If you do, you will be improving both your chapter, and your fraternity.